Dreamy music for enhancing meditation or encouraging deep sleep. 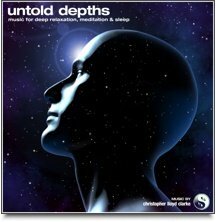 Untold Depths Binaural is one of our most popular downloads of all time. To really appreciate this music, pop on some headphones, close your eyes and listen quietly for a few minutes. This soothing, dreamy soundscape provides just enough stimulation to absorb your attention and draw you into a deeply relaxed state, but not so much stimulation that it ever becomes distracting. As this hour of music unfolds, Untold Depths will wash away all your thoughts and lead you into a state of mind that feels incredibly spacious and still. This music is perfect for enhancing meditation and for encouraging a restless mind to let go and relax at last. For enhanced meditation, select Untold Depths with theta binaural frequencies. For encouraging deep sleep, we recommend Untold Depths with delta binaural frequencies. This is "eyes closed" music, and it's very powerful but very gentle. Please do not listen while driving.